Renee’s Fine Cakes did a fine job of making the cake! A date for departure had finally been picked, Wednesday, August 28, 2013. 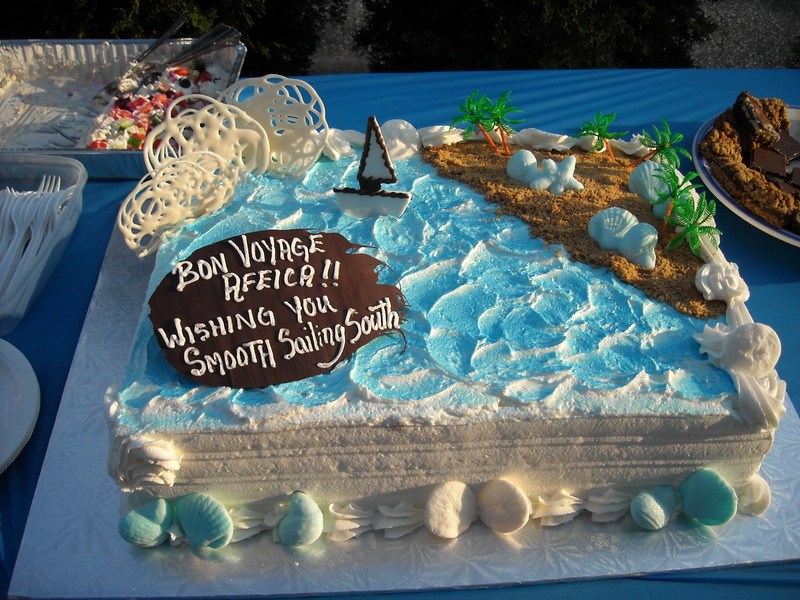 Our friends, Steve and Judy thought it would be a nice idea to have a little Bon Voyage party to wish AFEICA and her crew a safe journey on her adventure south. The perfect venue was “Green Acres” at the Windsor Yacht Club. The hot dog barbeque was attended by well wishers, which included family and friends. That gathering was held on Monday, August 19, 2013. Chris Eagen will be on the boat for the first leg of the trip from Windsor to Annapolis, MD after that there will be a crew change where Rick Janisse will be on the boat, from Annapolis to Fort Lauderdale, FL if his time permits. The boat will be laid up there over Christmas. The adventure will continue after visit home to Windsor to spend Christmas with family and friends. There were little bon voyages and wishes for fair sailing for the next few days while final preparations were made to leave the dock. Later, George was heard to say “That has to be the longest Bon Voyage Party on record”.